Vintage Mulberry: Waiting On Walker! 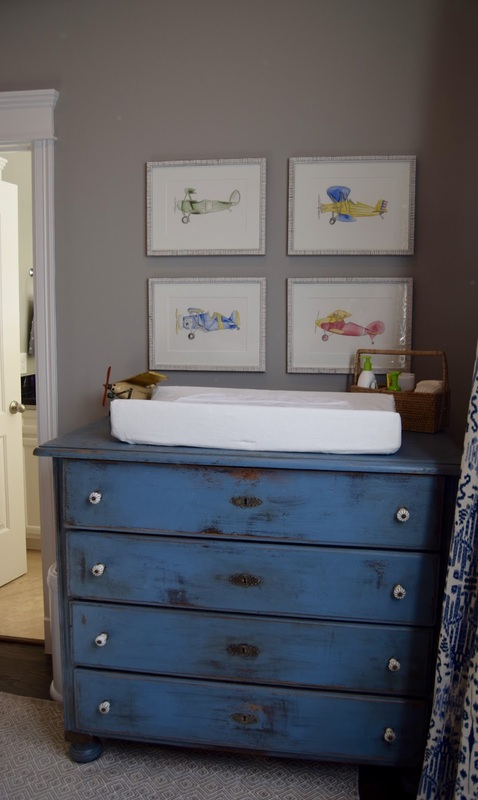 A Nursery Reveal. We are counting down the days until sweet baby James Walker Nichols arrives! He has been prayed for and dreamed about for a long time! I spent a week in Houston with my daughter and her husband last week and we had the best time finally getting to put all of this together! The curtains were hung and the day bed was finally made up with all of it's pillows that were either made from vintage african textiles or bought from one of our favorite shops! We hung this shelf and placed a few of the antique alphabet plates I'd been collecting over the years. Holly even bought some vintage blocks when we went to the Round Top antique show last fall and spelled out Walker's name with them. We thought ahead to the hospital stay and began to choose some options for his home coming arrival! As well as the beautiful watercolor prints that Holly's friend Abby painted! Finally, we began to see it all come together and we were able to sit back and enjoy it! 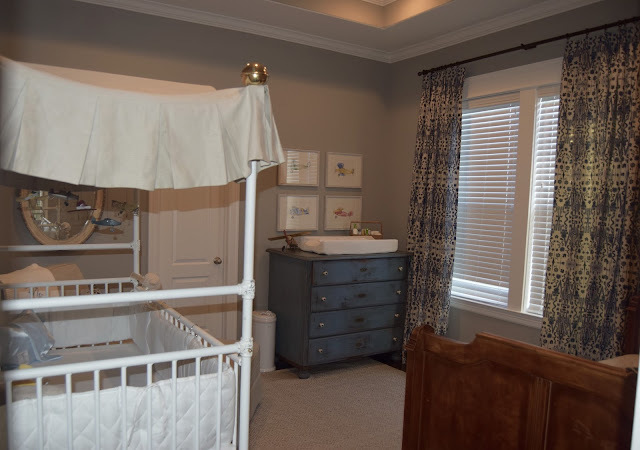 It was really fun for me to see how gorgeous the curtains and the baby bed linens turned out. This had been an agonizing project in the beginning but once the fabrics were chosen we had a wonderful seamstress Julie Ogard come to the rescue! 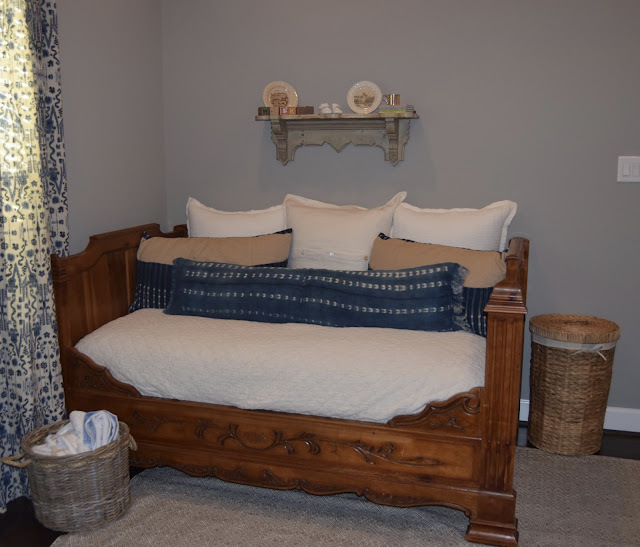 The fabric is from a company that my shop has carried pillows from called Lacefield Designs. Julie did a great job on everything, including this pillow that sits in the rocking chair. I actually enjoyed getting to do a little design work again as well as use some of the antique items I have treasured! This baby bed was very special as well as it was bought before we had our first child who is now 32! This will be the second grandchild that will use it. Holly really enjoys the little touches that make it personal. Like the silver cup on top of the shelf and the fun books she has collected. One of her dear friends gave her this monogrammed blanket and I am certain it will be involved in the homecoming ensemble as well! So for now we wait on Walker! Only God knows when he will arrive but at least the nursery is as ready as it's ever going to be! And I can assure you that Buy Buy Baby is depleted of a lot of it's inventory! I mean, really!! After two hours we had to just STOP! But it was all worth it! And Holly and Brad can take a breath for now. Little do they know how much is in store for them! I cannot wait to be back and get to hold that tiny bundle and enjoy him in this nursery that has been so lovingly prepared for his arrival into this world! Hope you enjoyed this little peak into the world of waiting on Walker! Carolyn, what a wonderful collaboration of live as you and your daughter prepare for the arrival of your little Walker! Your talents shine as you put them to such loving use. So happy for your whole family but especially for the joy you'll realize holding your new grandson. There's something very special witnessing your daughter becoming a mother - a pride like you've never known. So happy for you! Thank you , Jeanne! Love that you are my first comment on here! What a sweet friend you are! I am taking a blogging course as we speak and looking forward to growing both of my blogs! You are always the first one I think of! I love your sweet comments ( and I guess I'd love the not so sweet!) but I really just love that you were one of my first if not my very first blogging friend! Thanks for your support! Beautiful room! So many great pieces. I know y'all had the best time bringing everything together. Can't wait to see Walker! What a precious room. Congratulations on the upcoming sweet addition to the family! Thank you, Carla! Hope you are doing well! Oh what a darling room! I love all the details - so exciting! Thanks, Shelley! Great to hear from you! Such a precious nursery! Where did you find that vintage mobile?